Seven hour layover in Amsterdam Schiphol. At the transfer desk a friendly KLM representative tells us we have enough time to go see the city and still get back before boarding, plus it’s a nice day out. We decide to see if the excursions desk in the terminal is offering any tours. 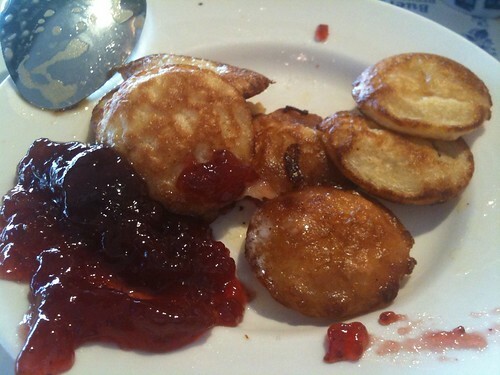 But first, a second breakfast to supplement the meager one we had been served before landing. The cafe near the Schiphol Rijksmuseum and Holland Casino serves omelettes and poffertjes, delicious fluffy mini-pancakes. 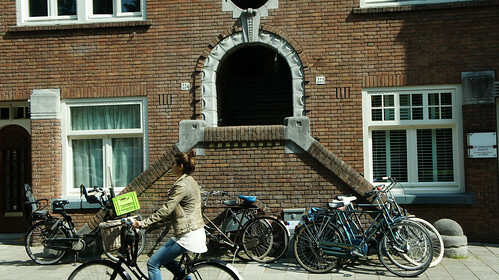 At the excursions desk the agent says we’re just in time for a 2 hour guided minibus tour of Amsterdam: €45 per person, price includes transport to and from airport, plus locker storage for bigger bags. The tour guide accompanies us through immigration and to the lockers, then out the arrivals terminal to the minibus. It’s delightful outside, just this side of chilly but with bright, warming sunlight. The tour is a bit rambly, almost a stream of consciousness at points. 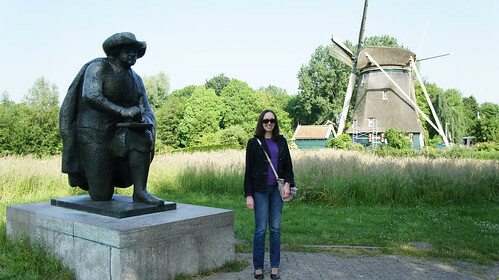 We start out in a more rural area outside Amsterdam called “De Ronde Hoep,” viewing old and new estates along the Amstel River, and stop for photos at an old windmill beside a recent statue of Rembrandt. I’m struck by how narrow the roads are, shared amicably by two-way car traffic, bicycles, and joggers, all in what amounts to barely two lanes along a river dike. Everyone has a bicycle here, and the roads are built to accommodate all at the same time, not just automobiles with bikes and pedestrians shrugged off to the side. It seems like a recipe for chaos and yet it works — partly because the infrastructure is so compact and integrated that no one needs to go too fast to get anywhere. We drive past a mini red light district (distinct from the red light district near Oude Kirk). The guide warns us not to take photos; the girls don’t like it. Dancers in various states of undress are displayed in windows like merchandise. People walk by, uncaring. The scene seems workaday; indeed, for these girls it probably literally is. And there are the coffee shops, dens for casual use of “soft drugs,” as the guide calls them. Some couch the marijuana references in visual euphemism, with illustrated smoke puffs punctuating their signage, while others plainly advertise hemp and cannabis products in their windows. 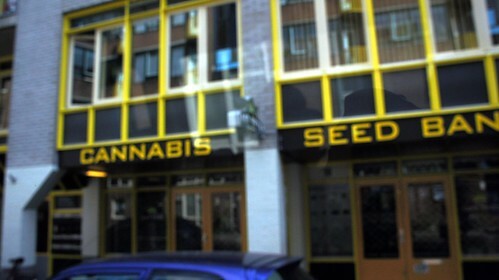 Still other establishments blatantly market cannabis supplies. A few stoners here and there, nothing rowdy and untoward. Again, it all carries an air of unaffected mundanity. On the other hand, this is all at 10 in the morning on a workday. Another river stop for photos, this time at “Prinsengracht” and “Centrum,” where a series of locks control access to the river and canals. 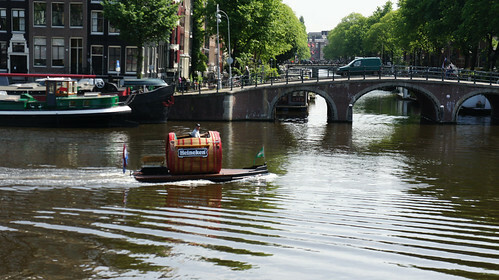 A Heineken promotional barrel boat floats serenely down the Amstel. We drive through various alleys and narrow streets full of restaurants and gift shops; the touristy ambience increases as we emerge onto the Damrak: a long, wide avenue through the center of Amsterdam that terminates at Centraal Station. 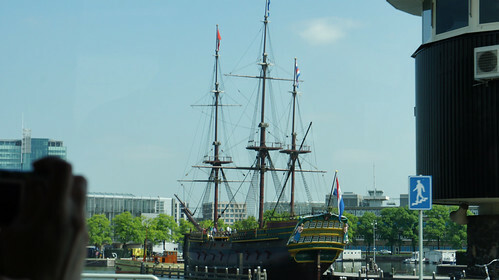 We drive past Nieue Kirk (newer than Oude Kirk but still pretty Oude) and over more canal, past a replica pirate ship and the NEMO science museum. Soon we are back on the highway to Schiphol, which the tour guide informs us was once a shallow basin that was literally a “ship hell” before it was drained, hence the name. 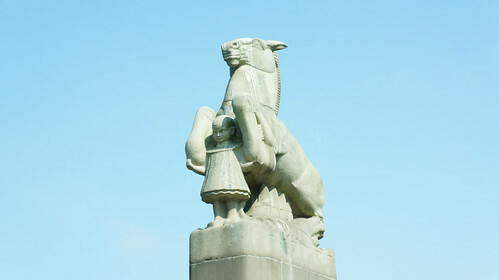 Additional interesting detail: our companions on this tour are a family from Texas. 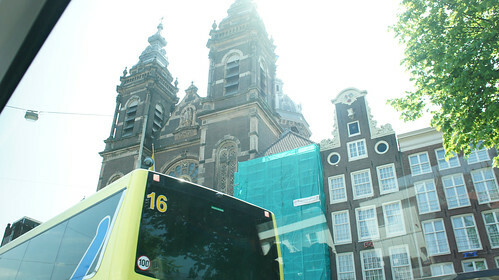 I find myself more amazed at their reactions to the Amsterdam tour as to Amsterdam itself, especially their comments on bicycling culture of the city and confusion at how anyone could be happy living somewhere with such high gas prices, higher taxes, narrow streets, and small cars. Back in the airport, time enough for a lunch of sausage and pasta before heading to our gate — only to find that the gate has changed. And on reaching the new gate, another gate change. But we make it, and are soon en route to Venice. Farewell for now, Amsterdam and the Netherlands; we shall return, hopefully someday soon. Full Amsterdam Layover Excursion photoset here.